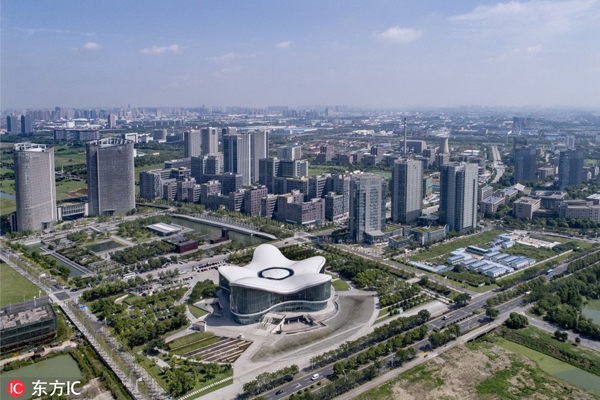 Wuxi National Hi-tech district (WND) has seen robust development in foreign investment, with $1.3 billion in foreign capital registered in 2018, ranking top in Jiangsu province. The advanced manufacturing industry accounted for 67 percent of the total foreign investment. The district has maintained its leading position for three consecutive years and the quality of foreign investment utilization has hit a record high since the district's establishment, making WND a provincial model for foreign investment utilization. With a focus on industrial development strategies, the district has worked to improve the quantity of foreign investment while attaching more importance to quality, attracting several key projects such as LG Group's automotive battery project, a smart manufacturing industrial park from Japan Murata Manufacturing Co and SK Hynix's M8 lab, each worth over 5 billion yuan ($738.86 million). Meanwhile, the district has stepped up efforts to foster its new energy battery industrial cluster, gathering a group of famous power battery manufacturers, including Panasonic Energy Co, GS Yuasa International and Samsung SDI. A complete industrial chain has taken shape, covering cathode materials, power cells and battery packs. By 2018, 50 key companies in the district had established headquarters in WND. Global semiconductor manufacturer SK Hynix signed an agreement in 2018 to set up its Chinese sales headquarters in the district. SK Hynix Semiconductor Company (China) has the most advanced technology and represents the largest investment in semiconductors in China. AstraZeneca, one of the world's largest suppliers of prescription drugs and medical services, is also pushing forward the headquarters development strategy, setting up a Chinese sales headquarters, business innovation center and R&D center for innovative bio-medicine in the new district. "Since 2018, Wuxi National Hi-tech district has diversified foreign investment utilization, ranging from cross-border mergers and acquisitions (M&A) and equity investment to round-tripping investment," an expert said. Bucher Industries, a globally operating technology group with a leading market position in mechanical and vehicle engineering, acquired Wuxi Deli Hydraulics Co last year. Cross-border M&A and equity investment can help domestic and foreign companies expand sales and achieve win-win results.